UFO SIGHTINGS DAILY: @HillaryClinton aide John Podesta seeks UFO files, March 1, 2016, Video, UFO Sighting News. 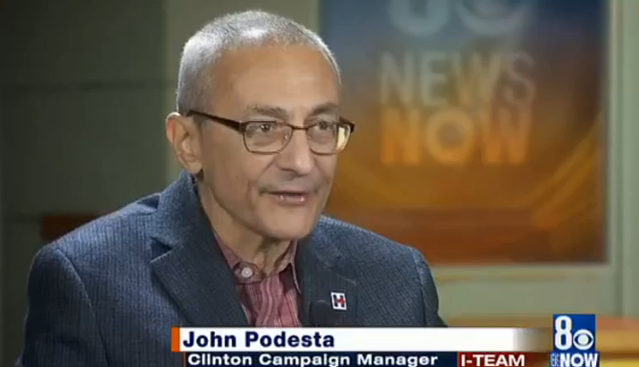 @HillaryClinton aide John Podesta seeks UFO files, March 1, 2016, Video, UFO Sighting News. Here is a great article today by George Knapp, a fantastic and highly respected UFO researcher and journalist. He dives in to discus the potential for John Podesta to push for UFO disclosure if Hillary Clinton is elected as US president. A lot of people are saying Hillary was making a joke when she said it, but I believe she was 100% serous. She not a comedian, she is carful about her words overtime she speaks. If she says it, then she will try. Thats all we can ask right? Several U.S. presidents are on the record, talking about the UFO mystery. Former Presidents Jimmy Carter and Ronald Reagan say they had UFO sightings of their own, but the current presidential campaign might be the first in which UFO disclosure has been championed by a major party candidate. During a recent campaign stop in Las Vegas, the campaign manager for Democratic presidential candidate Hillary Clinton told Politics NOW co-host Steve Sebelius that Clinton will try to get to the bottom of the UFO question. John Podesta has always been a strong advocate for declassification of government files in general and UFO files in particular. “I think the American people can handle the truth about this,” he said. As White House Chief of Staff for former President Bill Clinton, Podesta helped declassify hundreds of millions of documents. If there were UFO secrets being held somewhere, however, they eluded even the president. Podesta returned to the White House as a special advisor to President Barack Obama. On the day he left the job, he sent out a Tweet saying his biggest disappointment was the failure to find and uncover the UFO files. These days, Podesta has the ear of another potential president; he's running the campaign for Hillary Clinton. He made it clear to Sebelius that the UFO question has been discussed. “I've talked to Hillary about that. It's a little bit of a cause of mine, which is, people really want to know what the government knows, and there are still classified files that could be declassified,” he said. It wasn't an offhand remark. Podesta has encouraged journalists to ask his candidate about UFOs, and a few have done so. Mrs. Clinton told a New Hampshire newspaper that she intends to get to the bottom of the UFO mystery, thinks it is possible the planet may have been visited and would consider creating a task force to investigate Nevada's Area 51 military base. The base became a center of UFO attention more than 25 years ago because of reports that aired on KLAS-TV. CNN characterized Mrs. Clinton's remarks as jokes, but Podesta makes it clear that he and his candidate are serious. “I think I've convinced her that we need an effort to kind of go look at that and declassify as much as we can, so that people have their legitimate questions answered,” he said. “More attention and more discussion about unexplained aerial phenomena can happen without people who are in public life, who are serious about this, being ridiculed.” The Clintons know first-hand how the UFO topic invites ridicule. Many people may remember the frequent tabloid headlines during the Clinton presidency with titles such as “Hillary Adopts Alien Baby” or “Space Alien Endorses Bill.” More recently, conspiracy theorists have suggested there are UFO secrets hidden in Mrs. Clinton's private e-mails. It comes with the territory. “I come in for my fair share of people asking questions about whether I am off my rocker, but I've been a long-time advocate of declassification of records,” Podesta said. Huffington Post writer Lee Speigel has followed the UFO debate since the late 1970s. 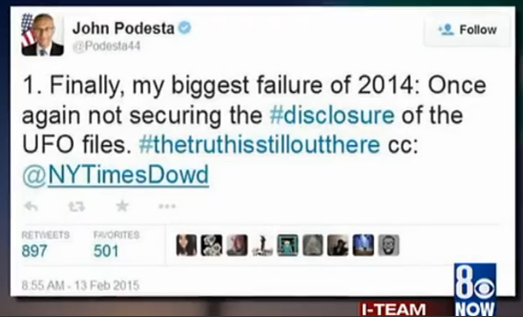 He notes that Podesta has been way out in front on UFO disclosure in speeches at places like the National Press Club. “It's time to open the books," Podesta told the club. “He ended one of his speeches by saying, not only could the public handle it, but we should do it because it's the law,” Speigel said. In the mid-1990s, billionaire Laurence Rockefeller lobbied the Clintons to end UFO secrecy. Mrs. Clinton was photographed with Rockefeller while holding a book titled, “Are We Alone? The Implications of Discovery of ET Life.” Bill Clinton has made public statements confirming that he tried to get to the bottom of UFO issues while in office. “First thing I did is send people to Area 51 to see if there were any aliens there,” he told late night host Jimmy Kimmel. The government's interest in UFOs officially ended with the closure of Project Blue Book in 1969, but suspicion remains that unexplained encounters involving national security are still being studied by someone. Podesta suspects someone is holding on to a large cache of UFO files. Speigel says several whistleblowers have surfaced over the years, including the late lunar astronaut Dr. Edgar Mitchell, who say secrets are still being kept. “There's military people coming forward now saying, ‘Yeah, the government never did stop investigating UFOs,’ and we need to own up to that,” Speigel said. “We can see what's going on here in Nevada,” Podesta said. Mrs. Clinton's rival for the Democratic nomination, U.S. Sen. Bernie Sanders, was also asked about UFOs. He said he is far more interested in issues that are more pressing for most Americans.